Insulin is a peptide hormone produced by beta cells within the pancreas. It is responsible for regulating movement of glucose from the blood into cells. This article will consider the structure of insulin, how it is synthesised and secreted, its actions on the body and clinical conditions that are associated with faults in its production. Insulin consists of two polypeptide chains, an alpha chain and a beta chain, covalently linked by two inter-chain disulfide bridges. 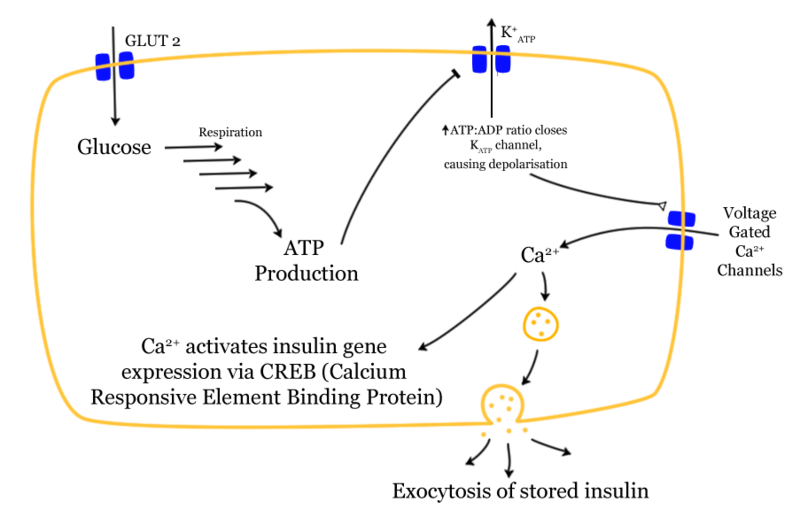 There is a third, intra-chain disulfide bridge. Insulin is synthesised in the Beta cells of the islets of Langerhans. Firstly, the Insulin mRNA is translated as a single chain precursor called preproinsulin. There is then removal of its signal peptide at the N-terminus during insertion at the endoplasmic reticulum. This generates proinsulin. In the endoplasmic reticulum, endopeptidases excise a connecting peptide (c-peptide) between the A and B chains. This breaks the single chain into two strands (A and B) that are held together by disulfide bridges – i.e. this generates the mature form of insulin. Equimolar amounts of insulin and free c-peptide are packaged in the Golgi into storage vesicles which accumulate in the cytoplasm. Fig 2 – Diagram showing the process of insulin synthesis. A rise in glucose levels in Extra-Cellular Fluid (ECF) is the stimulus for insulin release. Glucose is transported into the Beta cell by facilitated diffusion through GLUT2 channels. Therefore a rise in glucose concentration in ECF = a rise in glucose concentration in Beta cells. This leads to membrane depolarisation of ATP sensitive K+ channels, opening Ca2+ channels. There is thus an influx of extracellular calcium. Margination: the process by which insulin storage vesicles move to the cell surface. Short term blood glucose control: clearing absorbed nutrients from the blood following a meal). Long term insulin release for glucose uptake e.g. for cell growth, cell division, stimulating protein synthesis and DNA replication. 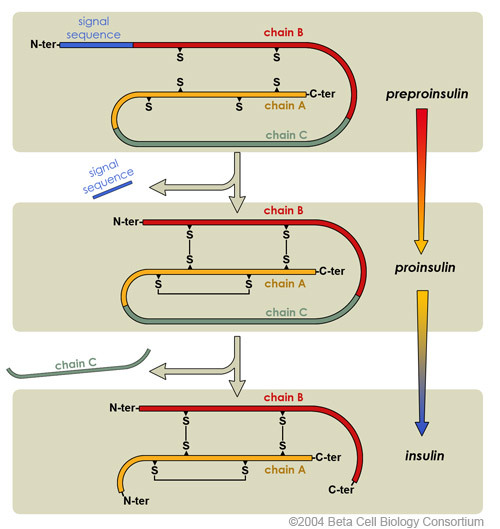 Insulin binds to a highly specific insulin receptor on cell surfaces. These are connected by a single disulfide bond. When insulin is detected, the alpha chains move together and fold around the insulin. This moves the beta chains together making them an active tyrosine kinase. This initiates a phosphorylation cascade which results in an increase of GLUT4 expression – a protein channel to allow glucose uptake. The result is an increase of glucose uptake by cells. Overall, Insulin can be considered the “anabolic” or building hormone – it assists processes that build compounds for storage and decrease processes which break down those storage reserves. In muscle and liver, insulin increases glycogenesis, and decreases glycogenolysis. Increased glycolysis in liver and adipose tissue. Decreased the breakdown of amino acids in liver. Increased amino acid uptake and protein synthesis in muscle, liver and adipose tissue. Increased lipogenesis and esterification of fatty acids in liver and adipose tissue. Type 2 DM involves a dual pathology: there is insulin resistance, i.e. there is normal insulin secretion but tissue become insensitive, losing their receptiveness to insulin. In a compensatory effort, beta cells work harder to produce insulin. This cannot be sustained and eventually there is also relative insulin deficiency in Type 2 Diabetes Mellitus. This can present with the classic triad of symptoms; polyuria, polydipsia and weight loss, although it is likely to be less noticeable than those with Type 1 Diabetes as it is a more gradual process. Initially Type 2 Diabetes can be treated by improving diet alone, however it may be necessary to use medications such as metformin or eventually insulin to help control blood glucose levels. Fig 5 – Diagram showing what occurs in insulin resistance. How many inter-chain disulphide bridges are there in a mature insulin molecule? In a storage vesicle containing endogenous insulin, what is the ratio of insulin to free c-peptide? 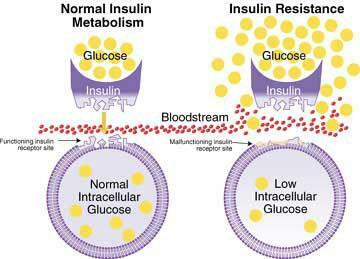 Which of the following best describes the mechanism by which insulin allows cells to uptake glucose? Which of the following is NOT considered an overall effect of insulin? What is the pathology in the early stages of Type II diabetes mellitus?